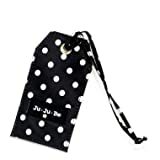 The Ju-Ju-Be 13AA10ATDU Be Tagged Legacy Collection luggage and travel bag identifier is a stylish accessory that secures your id to travel items, helping make them noticeable from faraway. It’s a simple idea; you have a great bag, so you need a great bag tag. A business card fits perfectly or this tag can be used to keep a picture of your child or family nearby. The Be Tagged is protected with an Agion natural antimicrobial treatment that inhibits and reduces the growth of odor-causing bacteria, mold and mildew. The outer fabric is treated with Teflon fabric protector, making it easy to repeal stains and keep the be tagged clean. Designed with a 7-inch drop strap, the Be Tagged can be tied or looped to securely stay on your bag or luggage. The Duchess design is a black and white fabric that’s lined in a beige trim and detailed in gold accents. This tag measures 2.75-inches by 5.25-inches in size. The Ju-Ju-Be 13AA10ATDU Be Tagged Legacy Collection luggage and travel bag identifier comes with a 90-day limited warranty that protects against manufacturing defects. 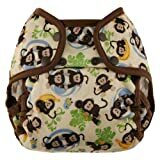 Founded in 2005, ju-ju-be is a southern California company that fuses science, style, and attitude to create diaper bags, purses and other accessories that are both fashionable and fun. Ju-ju-be assimilated the most advanced technology possible to create a stylish and intelligent product line that’s unrivaled in the industry. 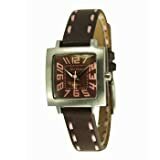 18mm Army Green – With Gold Buckles Nylon Nato Ballistic Military Watch Band Strap G-10! Fits All Watches!!!! !